For other uses, see Tintern (disambiguation). Tintern (Welsh: Tyndyrn) is a village and community on the west bank of the River Wye in Monmouthshire, Wales, close to the border with England, about 5 miles (8.0 km) north of Chepstow. 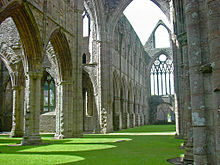 It is popular with tourists, in particular for the scenery and the ruined Tintern Abbey. 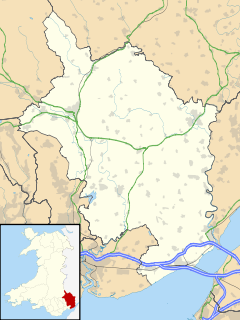 Modern Tintern has been formed through the coalescence of two historic villages; Tintern Parva, forming the northern end of the village, and Chapel Hill, which forms the southern end. The village is designated as a Conservation Area. A ford across the navigable and tidal River Wye was in use in Roman times, close to the site of the abbey. 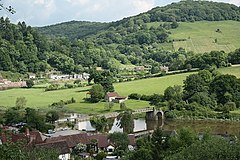 After the Romans withdrew from Wales, the kingdom of Gwent emerged, and, according to tradition, in the 6th century one of their kings, Tewdrig, came out of retirement as a Tintern hermit to defeat the invading Saxons in battle, perhaps at a site known today as Pont y Saison (Bridge of the Saxons) in the Angiddy Valley. The name Tintern may derive from the Welsh din + d/teyrn, meaning "rocks of the king". Tintern Abbey was founded beside the river by Walter de Clare on 9 May 1131, during the reign of King Henry I. It was the second Cistercian foundation in Britain, and its monks came from a daughter house of Cîteaux in France. The present-day remains at Tintern are a mixture of building works covering several centuries. Between 1270 and 1301 the abbey was rebuilt, and when it was completed around four hundred monks lived in the complex. The abbey's land was divided into agricultural units or granges, and local people provided farm labour and served the abbey and its many visitors. For 400 years, it dominated the economy of its surrounding area. During some of this period the area was contested between the Welsh and English, the closest battle being won in 1404 by Owain Glyndŵr, at Craig y Dorth near Monmouth. The area also had to contend with the Black Death, and it is suspected that the neighbouring village of Penterry disappeared at that time. The abbey remained in operation until the Dissolution of the Monasteries in 1536. Though it has been suggested that the monks or lay brethren of Tintern Abbey exploited the woodlands and river power for operating iron forges, evidence of this is lacking. Industrial activity began in 1568 when the newly established Company of Mineral and Battery Works built a wireworks. It is possible that brass was made, but the works mainly made iron wire. This was used for a wide variety of industries with essential goods: cards for the woollen industry, nails, pins, knitting needles and fish hooks. The site was convenient, because the Wye offered transportation, the Angiddy stream provided water power, trees in nearby woods were used for charcoal fuel, and the locality provided a ready supply of minerals. The company began letting their works. Farmers of the works in the 17th century included Sir Basil Brooke, Thomas Foley, the important ironmaster and his son Thomas Foley. A blast furnace and forges were built in the valley in the 17th century and operated with the wireworks until the end of the 19th century. For 300 years, the numerous works and forges along the Angidy Valley dominated the village and surrounding communities. A branch from the Wye Valley Railway to the Lower Wireworks by way of a bridge was completed in 1875, but too late to stop them going out of business. In 1878 a new company leased the site to manufacture tinplate although by 1895 it was reported as closed and only some ruins, associated ponds, leats and culverts are now visible. The bridge was used in the early 20th century as a horse-drawn tramway and now carries a tourist footpath to the opposite bank. By the late 18th century, tourism had started in the Wye Valley, with many visitors travelling on the river to see the abbey and other "picturesque" sites in the area. William Wordsworth stayed in the village in 1798 and wrote Lines composed a few miles above Tintern Abbey. The completion of the turnpike road (now the A466) in the valley in 1829, and the arrival of the Wye Valley Railway in the 1870s, greatly increased the number of visitors, and tourism became the mainstay of Tintern's economy and remains so today. The Royal George Hotel is one of several hotels, inns, and guest-houses located beside the main road. The ruins of St. Mary's Church can also be seen on a hill to the west of the abbey. Medieval in origin, the church was virtually rebuilt in 1866-68 by John Prichard. While much of the church is still clearly visible today, a fire in 1977 left the building in ruins. The churchyard is now maintained by volunteers. A disused water-driven mill lies in the 'Abbey Mill' area northwest of the abbey. Visitor information and shops can be found close by. The village also boasts an award-winning vineyard. The former public house, The Moon and Sixpence, was originally known as the Mason's Arms, but changed its name in 1948 following a visit by Somerset Maugham, author of the 1919 novel of the same name. The church of St Michael, Tintern Parva dates back to mediaeval times (a church on the site was recorded circa 1348). It was substantially rebuilt in 1846 (although pictorial records suggest it was relatively similar in appearance before and after the rebuilding) and has remained largely unchanged since. The south porch may date to the fifteenth century. The churchyard includes a variety of nineteenth century memorials, including one for John Loraine Baldwin, former warden of the abbey. Tintern railway station was on the former Wye Valley Railway. Approaching Tintern, the railway crossed the Wye to bypass the village on the other bank. Closed to passengers in 1959, the station, a mile's walk above Tintern, functions as a tourist centre. ^ "Community population 2011". Retrieved 4 April 2015. ^ "CHAPEL HILL, St. Mary (1863-1868) Monmouthshire". ICBS Archive of Church Plans. The Incorporated Church Building Society. Retrieved 25 May 2011. Wikivoyage has a travel guide for Tintern. 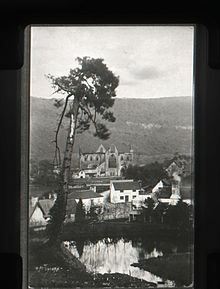 Wikimedia Commons has media related to Tintern.